I’ve mentioned in an earlier review that Silvestrov has been getting some overdue attention recently, with a number of recordings in recent years. Here we have another Silvestrov release from ECM New Series, which have put out several discs of Silvestrov’s work in the past few years, including a requiem, orchestral music, and his massive Sixth Symphony. Since I’ve included biographical details in that review, I’ll move straight on to the music and the performances. Post Scriptum, which opens the disc, is unmistakably Silvestrov. Even with these chamber works one experiences the same sense of great things looming out of a dense fog. Or, as in the case with Post Scriptum, a sense of something definite dissolving into that fog. The piece begins with an innocent and sentimental theme stated in the violin which forms the basis of the evaporating variations that follow it in the first movement. The tender theme returns in the piano and pauses before the violin escalates. In flashes, there is something almost Mozartean about some of the writing here, but these are carefully controlled. Indeed, the liner notes mention that Silvestrov saw Post Scriptum as a “postscript to Mozart and, in a broader sense, to the classical period.” The slow central movement is wonderfully warm and melodic. Of the Silvestrov works I’ve heard, this is the composer at his most accessible and touching. 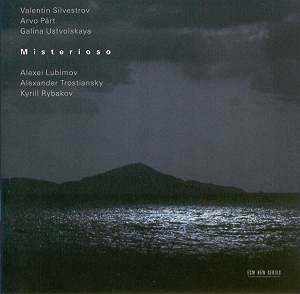 Misterioso was written just after the aforementioned Sixth Symphony and shares its sound, condensed to two instruments. Here, instead of an orchestra we have the piano providing large chords that boom and fade as the clarinet adds metallic scrapings and exclamations. There is no sense of a formal development immediately apparent—the work has a strange suspended, motionless feel about it, which, upon listening, is in direct contrast to the amount of effort the clarinettist must expend, with many variances of timbre and wide jumps in pitch, all while under utmost control and often almost exclusively pianissimo. Spiegel im Spiegel by Pärt has been rather well-represented with quite a number of recordings that are readily available. Here, in the arrangement of the work for Clarinet and Piano, the recording aesthetic is as good as you’d expect from ECM, with wonderful clarity, as well as a good sense of the space the piece was performed in. The piano plays a sweet, repetitive melody as the solo instrument plays simple scales. The idea behind the piece was, as Pärt mentioned, to “present constantly changing views of a single musical object” and it does just that, with the melody and scalar playing modulating softly throughout. The performance here is touching and devout. Two chamber works of Galina Ustvolskaya, who studied composition under Shostakovich in the ’forties, close the disc, beginning with one of her earliest post-graduation pieces, the Trio of 1949. The opening third of the first movement is devoted to the clarinet and piano, who talk past each other before the violin bursts in energetically. Interestingly enough, Shostakovich himself quotes a theme played by the clarinet in the third movement in his own String Quartet No. 5 and in his late Michelangelo Suite. At the same time one can hear the influence of Shostakovich in this trio, one can also hear a greater underlying sense of detachment which was to play an important role in Ustvolskaya’s work and in her life. The scored parts work together, but stand at arm’s length from each other. An austere and beautiful piece. The Sonata of three years later opens with the violin playing a simple two-note motif that is carried through the piece in a sort of wooden lockstep. Shostakovich is still here, but also Hindemith, though Hindemith is rarely this detachedly chill. Again the scored parts seem to talk past each other. By the end, the piano plays its cold counterpoint as the pulse of the piece is rapped out on the body of the violin. A striking and thought-provoking work. As with the other discs I’ve reviewed from ECM New Series, the sound quality and recording ambience is exemplary, Lubimov, Trostiansky, and Rybakov are spot-on in their performances of these works.